“My Parents’ Home,” a permanent type of “Chiiki no Chanoma,” was closed after 10 years of operation. However, Ms. Kawada, hoping that the members could continue to meet one another as they wished, continued the activity and started again at the Community Center and named it the “Parents’ Home Living Room.” Later, it became a model project of building an integrated community care system that Niigata City worked on. Then, the model house of an integrated community care system “Shichiku  Living Room of Parents’ Home” was recreated through a collaborative management of Niigata City and an unincorporated association “Living Room of Parents’ Home Steering Committee.” Now, the Shichiku  Living Room of Parents’ Home attracts nationwide attention and it has been visited and observed almost every day. The Chiiki no Chanoma that Ms. Kawada opened has also spread to the entire country quite rapidly. What are in these places that Ms. Kawada creates such a difference? Everyone wants to know the secret of such special places and they take the trouble of coming all the way from distant places. The first thing I felt was I felt very much at home there, and I did not feel any distinction between the staff members and the users. They did not put users in a service receivers’ position. These are the main elements. I thought that the Living Room is not merely a place to be in but a place where each person’s character and individuality are drawn out and appreciated. * Mr. Hiroshi Shimizu: President of “Ba-no-kenkyujo” (NPO); an honorary professor of the University of Tokyo, the proponent of the Theory of Ba (place/space). Offering “life” means to offer one’s “life” without considering profit or loss. Offering a “life cycle” means that when creatures offer their lives to a place, the place itself will offer back its “life” to the creatures, and that is how the cycle continues. For the operations of Shichiku, Niigata City shoulders only the rent and utility expenses. All the other expenses are shouldered by the admission fee of ¥300 a day, the supporting member’s fee of ¥2,000 from the people except for Shichiku, and the income from the bazaar selling donated items which has been held continuously. This means Shichiku is needed by the people in the community. I firmly believe that this is the model of a “co-existing community” and the hope of a super-ageing society. 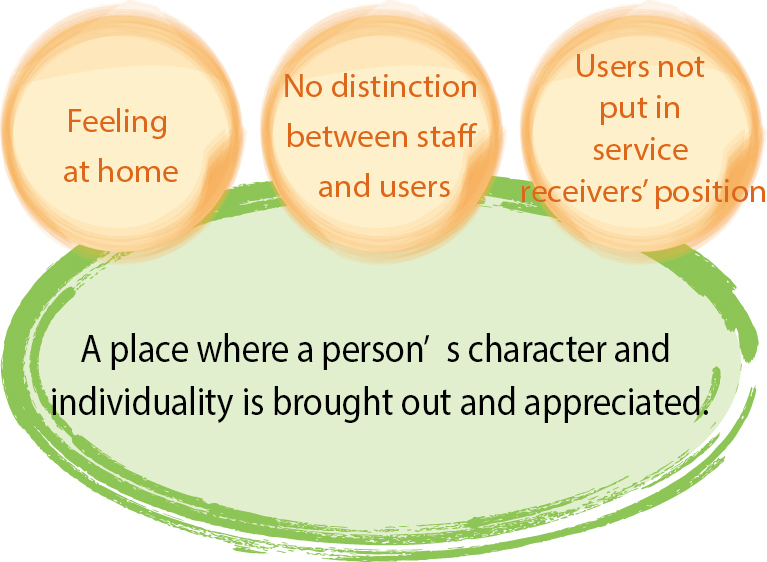 Copyright (c) 2007-2016 Japanese Society for Rehabilitation of Persons with Disabilities（JSRPD）All Rights Reserved.